Another of the opulent Victorian hotels built at London’s railway termini, the Midland Grand Hotel was designed by Sir George Gilbert Scott in an ornate High Gothic style. Scott’s design for the new hotel – which was to be built adjoining the railway station and would form its southern facade on Euston Road – was selected over 10 other submissions to win an 1865 competition run by the Midland Railway Company. Scott was apparently reluctantly involved – he only entered the competition after pressure from one of the company’s directors despite apparently previously refusing to get involved with the project prior to that. His expensive – and expansive – design (apparently resembling his rejected plans for government offices in Whitehall) included an 82 metre high clock tower at the east end of the more than 170 metre long facade and a 76 metre high tower at the west end (it also originally had an extra floor that wasn’t included in the final building). The luxurious property – considered from the outset one of London’s best hotels, it cost whopping £438,000 – featured some 300 bedrooms, a grand double staircase, curved dining room and mod-cons like water-driven lifts (it was the first private building to boost these and one remained in place until 1958), an electric bell calling system and flushing toilets. Staff communicated via a system of speaking tubes and wary of fires after the Palace of Westminster burned down, a “fireproof floor”. The property also boasted the first ladies’ smoking room in London in 1873 and, in 1899, the first revolving door in Britain was installed at the entrance. Decorative details in the best guest rooms, meanwhile, included Axminster carpets, carved marble fireplaces, 18 foot high ceilings, and vast windows. En suite bathrooms, however, were not included. The hotel’s east wing opened on 5th May, 1873, but it wasn’t completed until spring of 1876. One Herr Etzesberger, formerly of the Victorian Hotel in Venice, was apparently appointed general manager. Guests included music hall singer and comedian Marie Lloyd, Jesse Boot (of Boots chemists fame), railroad and shipping entrepreneur Cornelius Vanderbilt and George Pullman (of the Pullman sleeping car fame). The hotel was taken over by the London, Midland and Scottish Railway in 1922. It closed in 1935 thanks to its now outdated and expensive-to-maintain facilities and, despite innovations like a Moroccan coffee house and in-house orchestra. Renamed St Pancras Chambers, the building was subsequently used as railway company offices. 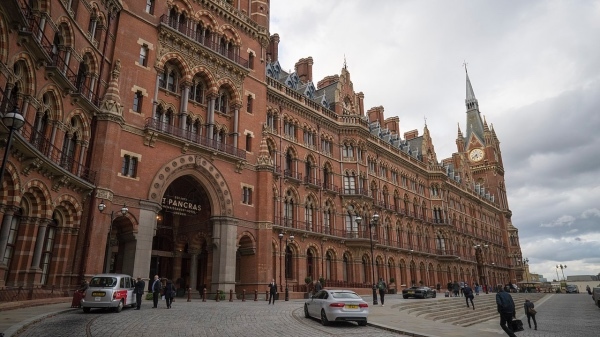 It survived the Blitz and attempts to have it demolished thanks to a high profile campaign led by poet Sir John Betjeman, architectural historian Nikolaus Pevsner and the Victorian Society and in 1967 the hotel and St Pancras station were given Grade I-listed status. British Rail continued using it as offices but in the 1980s the building was deemed unsafe and closed. 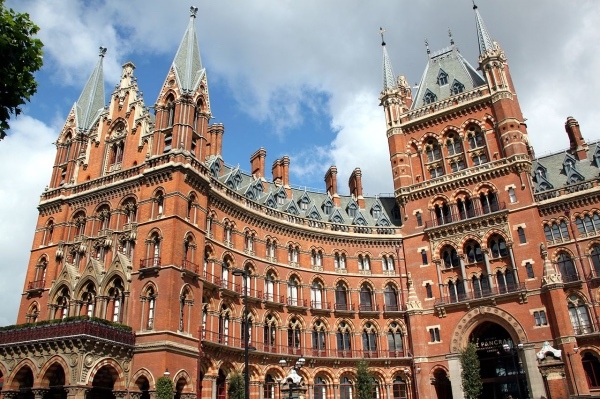 It was restored in the 1990s and in 2004, permission was given for it to be redeveloped into a new hotel – the same period during which the station was being redeveloped into one of the largest rail termini in Europe in order to accommodate cross-channel trains. This project saw the main public rooms of the old Midland Grand Hotel kept and restored as well as some bedrooms while the former driveway for taxes was converted into the new lobby and a new bedroom wing constructed. The upper floors of the original building, meanwhile, were converted into 68 apartments. 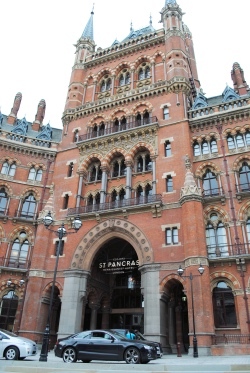 The five star, 245 room St Pancras Renaissance Hotel opened on 14th March, 2011, to guests but the formal opening took place on 5th May that year – exactly 138 days after it first opened its doors. Facilities at the property today, part of the Marriott group, include The Chambers Club, The Booking Office Bar & Restaurant, MI + ME, The Marcus Wareing-designed Gilbert Scott Restaurant, the Hansom Lounge – where afternoon tea is served, and George’s Bar. There’s also a spa and leisure club and pool and meeting facilities. 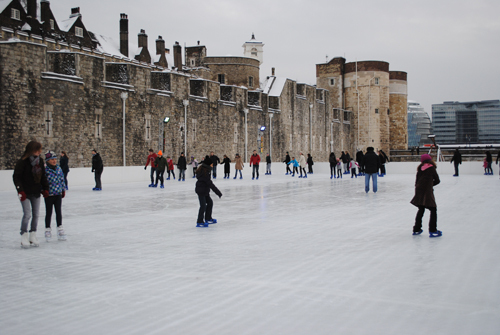 The premises has appeared in films including the The Secret Garden, Richard III, Batman Begins, Bridget Jones’ Diary and Harry Potter and the Chamber of Secrets. It also served as the backdrop for the Spice Girls video clip, Wannabee. PICTURE: Top – LepoRello (licenced under CC BY-SA 3.0); Right – David Adams; Below – Jwslubbock (licenced under CC BY-SA 3.0). 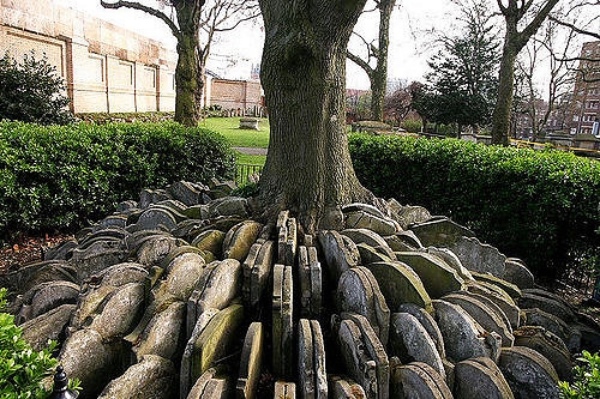 Having died in 1797 at the age of just 38, Mary Shelley’s mother and noted feminist, Mary Wollstonecraft, was buried in the churchyard of St Pancras Old Church. Apart from the fact it is where her mother was buried, the grave played an important role in Shelley’s story. 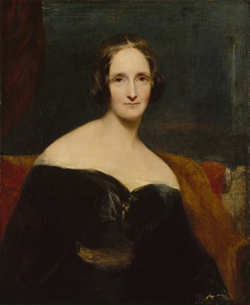 Not only is it said that her father, William Godwin, taught her to read her name by tracing the letters on the gravestone, it later became a place of key importance for Shelley in her developing relationship with Percy Bysshe Shelley. In fact, it was at this gravestone that Mary and the poet would meet in secret prior to their elopement to Europe (some even speculate it was here that they first consummated their love). Secrecy was a necessity – Percy Shelley was already married and Mary’s father disapproved of their relationship. 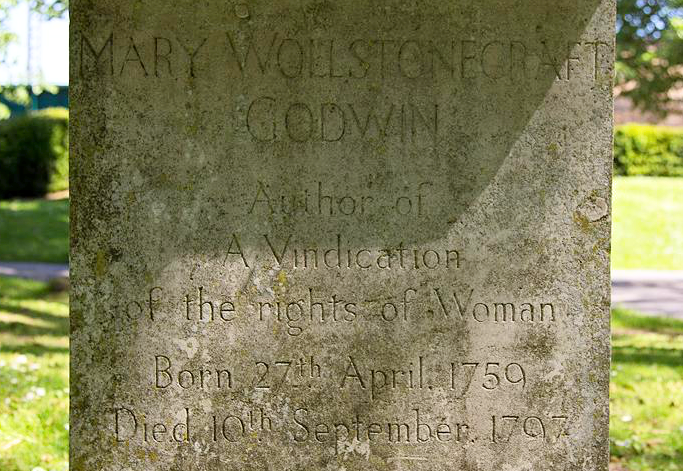 Interestingly, Wollstonecraft is no longer buried here (although the gravestone still stands there). In 1851, as per the wishes of Mary Shelley, Wollstonecraft’s remains – and those of her husband which were buried there after his death – were removed by her grandson, Percy Florence Shelley and reinterred in the Shelley family tomb in St Peter’s Churchyard in Bournemouth. The tomb is Grade II-listed. The lettering was restored in 1992 to mark the bicentenary of the publication of Wollstonecraft’s A Vindication of the Rights of Woman. 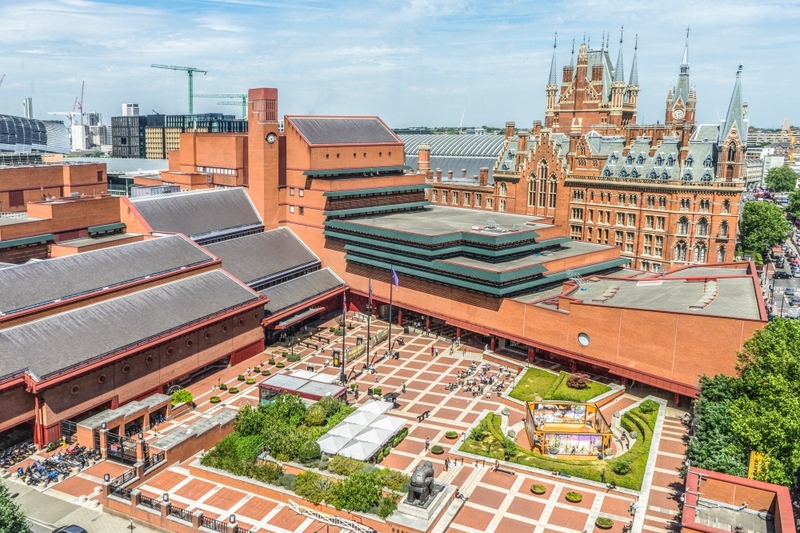 This week marked 20 years since the British Library’s St Pancras building was officially opened, so we thought it timely to take a look at this London ‘treasure’. Located on Euston Road, the building, complete with rather grand piazza, was designed by architect Sir Colin St John Wilson and his partner MJ Long. 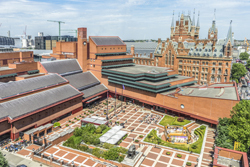 The largest public building to be constructed in the 20th century in the UK, it was designed specifically to house the British Library collections – which itself had only been created in 1972 when an act was passed by Parliament. The building – which did draw some criticism over its design when it was completed but has been embraced by the public – was officially opened by Queen Elizabeth II on 25th June, 1998. Grade II-listed since 2015, it’s comprised of 112,000 square metres spread over 14 floors – including five below ground – and features 11 reading rooms specialising in various subject areas including one for ‘manuscripts’, another for ‘maps’ and another for ‘rare books and music’. The centrepiece of the building is the King’s Tower which is home to the library of King George III and the Sir John Ritblat Treasures of the British Library Gallery. The collection housed at the library includes more than 150 million items. Highlights – many of which are housed in the Treasures Gallery – include a copy of the Magna Carta, the Lindisfarne Gospels, and Leonardo da Vinci’s notebook as well as a first edition of The Times (18th March, 1788), manuscripts by everyone from Jane Austen and James Joyce to Handel and the Beatles, and the Diamond Sutra, the world’s earliest dated printed book. The library, which also hosts temporary exhibitions, is also home to a restaurant, cafe and several coffee shops as well as its own retail shop. There are now plans to further develop the campus by expanding onto a 2.8 hectare site at its northern end with the aim, among other things, of creating more exhibition spaces, new learning facilities and a permanent home for the Alan Turing Institute, the UK’s national centre for data science and artificial intelligence. A joint venture led by Stanhope plc, working with architects Rogers Stirk Harbour + Partners (RSHP), won a competitive process to undertake the development last year. WHERE: British Library, 96 Euston Road (nearest Tube stations are Kings Cross St Pancras, Euston and Euston Square); WHEN: 9.30am to 6pm (includes Treasures Gallery – exhibition times can vary); COST: Free (but admission fees may be charged for exhibitions); WEBSITE: www.bl.uk. PICTURE: Top – Aerial view of the St Pancras building (Tony Antoniou); Below – One of the reading rooms (Paul Grundy). 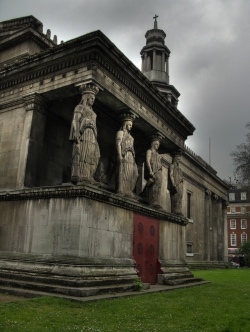 An intriguing feature at St Pancras Church are the eight female figures known as caryatids employed to support the rooves of two pavilions standing above the north and south entrances to the crypt. 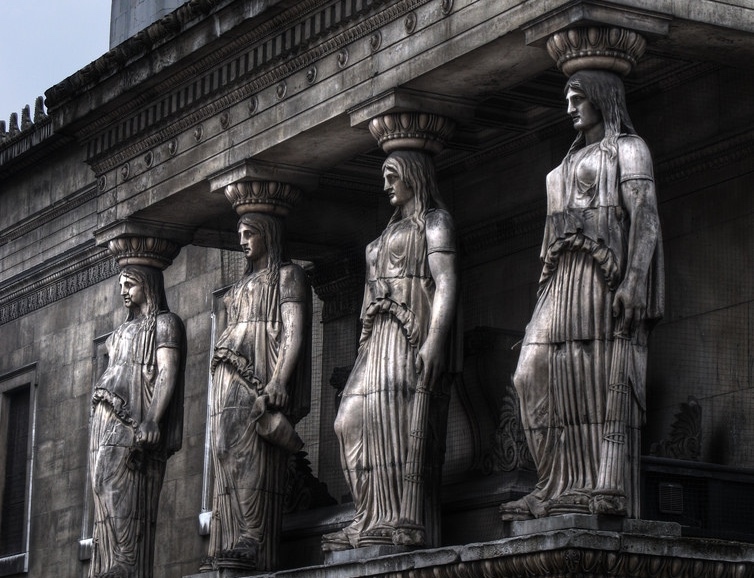 The caryatids are modelled on those on the Erechtheum on the Acropolis in Athens – Henry William Inwood, who designed the church with his father William Inwood, apparently brought plaster casts of the original back to England to help with their plans for the building. The caryatids, which were modelled by John Charles Felix Rossi, are made of terracotta constructed around cast iron cores. An original from Athens can be seen in the British Museum. Unlike the caryatids on the Athens’ structure, however, each of the Inwoods’ statues carries an extinguished torch or empty jug, a reference to their position over the entrance to the crypt – a place of the dead. 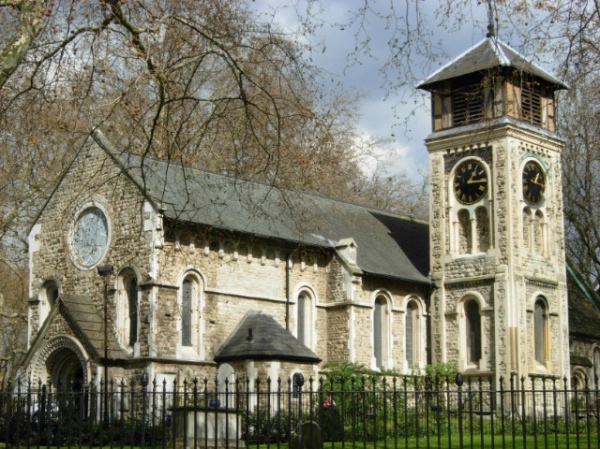 The entire building, which is also known as St Pancras New Church to distinguish it the original St Pancras Church which is located to the north, was built between 1819-1822 and is an early example of the Greek Revival style. Other features of the church which also reference this style include its octagonal tower, modelled on the Tower of the Winds in Athens. The church (we’ll take a more in-depth look at the building as whole in an upcoming post) now has a Grade I listing. PICTURE: Tony Moorey (licensed under CC BY 2.0) Top image cropped. • From Peter Rabbit to Aesop’s Fables, animals and their appearance in some of the classics of literature are the subject of a new exhibition which opened at the British Library in St Pancras yesterday. Animal Tales explores the role animals have played in traditional tales around the world along with their importance in the development of children’s literature, and their use in allegorical stories such as CS Lewis’ The Lion, the Witch and the Wardrobe as well as literary transformations between man and beast (this last in a nod to the fact it’s the centenary of Franz Kafka’s The Metamorphosis). Highlights in the exhibition include one of the first children’s picture books – the 1659 edition of Comenius’ Orbis sensualism pictus, an 18th century woodblock edition of Wu Cheng’en’s Journey to the West, and a soundscape installation drawn from the library’s world leading collection of natural history recordings along with other animal tales from the sound archive. 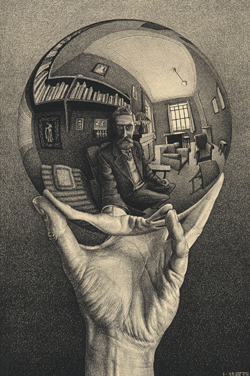 The exhibition, which runs until 1st November, will be accompanied by a series of events. Entry is free (and the display includes a children’s reading area and a family trail brochure). For more, see www.bl.uk. 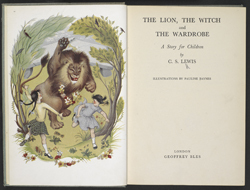 PICTURE: The title page from the 1950 London edition of CS Lewis’ The Lion, the witch and the wardrobe. © CS Lewis Pte Ltd.
• Gladiators will battle it out on the former site of London’s open air Roman amphitheatre in Guildhall Yard this weekend. The shows – which will recreate what gladiatorial games were like in Roman Londinium – will be presided over by an emperor with the crowd asked to pick its side. The ticketed event, being put on by the Museum of London, takes place Friday night from 7pm to 8pm and on Saturday and Sunday, from noon to 1pm and between 3pm and 4pm. Admission charges apply. To book, see www.museumoflondon.org.uk. 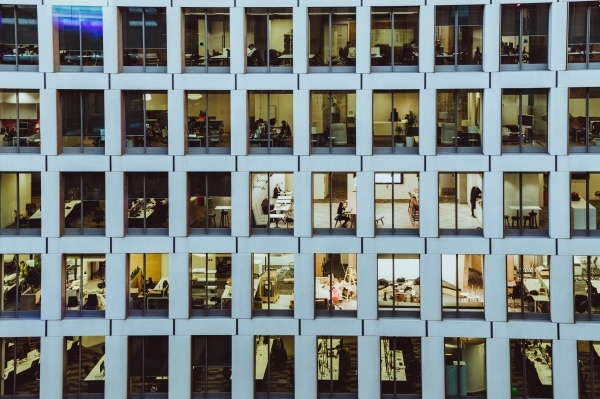 • A new International Visitors Victim Service has been launched in London to specifically help foreign nationals affected by crime in the city. The first of its kind in the UK, the service, which has been established by the Metropolitan Police working with independent charity Victim Support and embassies, already operates across the five central London boroughs and is now available through a mobile police kiosk located in the West End’s “impact zone”, an area which spans Leicester Square and Piccadilly Circus (alternatively they can contact the International Visitor Advocates by calling 0207 259 2424 or visit the West End Central Police Station at 27 Savile Row. • The Mayor of London, Boris Johnson, has celebrated the creation of 100 new pocket parks across London’s 26 boroughs in a scheme which is now being adopted by other locations across the country. The parks range from a rain garden in Vauxhall to a dinosaur playground in Hornsey and have seen more than 25 hectares of community land converted into enhanced green areas. A free exhibition is running at City Hall until 28th August which focuses on the stories of 11 people involved in the creation of the parks. For more on London’s “great outdoors”, you can see an interactive map at www.london.gov.uk/outdoors. In contrast to the colourless smog which has lain over London, Scottish artist David Batchelor’s sculpture, Chromolocomotion, brings a splash of colour to the Grand Terrace at St Pancras International. Unveiled this week, the 20 by 10 metre work consists of 44 L-shaped pieces of coloured perspex suspended from the Grade I-listed roof of the Barlow Shed. 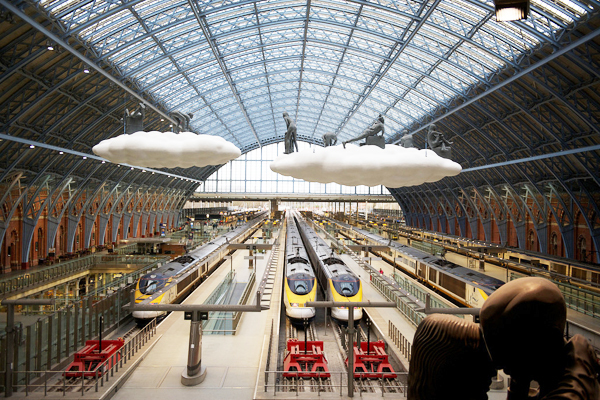 It replaces Lucy and Jorge Orta’s Cloud: Meteoros and is the second installation commissioned by St Pancras International’s owners HS1 Ltd as part of the Terrace Wires initiative. The work will remain in place until late September. For more on the initiative, see www.terracewires.co.uk. 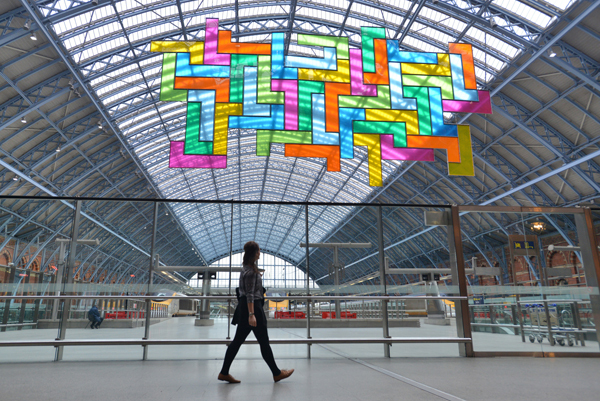 PICTURE: HS1 Ltd.
Lucy and Jorge Orta’s sculpture Cloud: Meteoros is the first sculpture to be unveiled for the ‘Terrace Wires’ project at St Pancras International. The sculpture, which hangs on wires from the station’s roof, features two clouds hovering over the station floor on which figures can be seen looking down. Says artist Lucy Orta: “Our sculpture is symbol the space in between: that of the daily routines of the millions of passengers and visitors to the station and the freedom of our imagination, daydreams – looking up to the sky.” The sculpture will remain in place for the rest of the year. For more on art at St Pancras, see http://stpancras.com/art/ and www.terracewires.com. PICTURE: Sam Lane/HS1 Ltd.